Just the polish itself, not the trio. The glitters look cool in swatches, but I still haven't seen this collection in person. 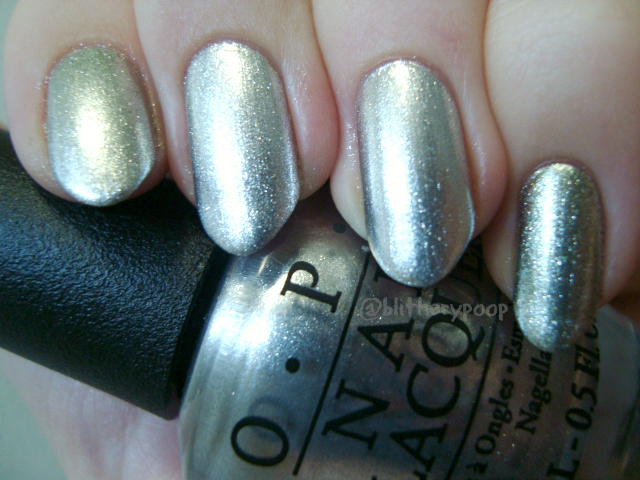 I bought this online during Ulta's last OPI BTGO sale...and they're doing it again, if you missed it last time. It's a good deal, but not good enough to trigger a frenzy, so I managed to be selective. If it turns up at the nail supply, I can see myself being swayed by at least one of them. 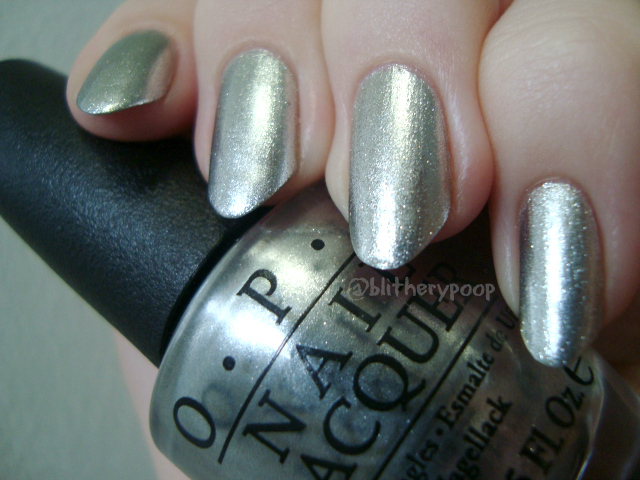 I have a serious thing for silver foils and there's always a hope in the back of my mind that one will be even better than Nicole by OPI Give Me The 1st Dance. Unfrost My Heart looked like a contender, so I snagged it. Unfrost My Heart is a bright silver foil. Radiant! The foil bits are so tiny that it's even kinda reflective. This is two coats and it's almost too shiny for its own good. ...but how does it stack up to other silver foils? I grabbed a few to see. Unfrost is closer to the dreaded Bieber polish than most other silvers I've tried, but I'm not sure if I beats it. They're not quite dupes, since Give Me The 1st Dance is coarser. (I wince each time I type "1st"...eww.) Shine is a touch warmer and Your Royal Shine-ness is considerably darker. The difference between Unfrost and GMt1D is more obvious when the light really hits them. It's twinkle vs. reflection. Bottom line: Unfrost My Heart is bright, super smooth, and showy. I love it! If you're a silver foil fanatic or are looking for your first, it's worth getting. Do you have a favorite silver, foil or otherwise? It's such a great color for the holiday season, no matter what you celebrate.